A kurta is a free-spirited garment that is much rooted in the Indian culture but gone are the days when a guy picked out a kurta only for an occasion like Diwali or Holi or someone’s wedding. Kurtas for men have been mainstreamed into our daily wear and are not just reserved for big Indian festivals. Men wear short, long, plain, and colourful kurtas to work, parties, and pretty much everywhere. Nothing says handsome like a guy wearing a short kurta with rolled up sleeves, paired with a smart pair of jeans. Tall, short, skinny, or chubby, a Kurta suits everyone. Here are a few tips that will you help you make the right choice. Shirts for men have been the go-to garment for a guy in his wardrobe since time immemorial. On an average, a guy owns 30 shirts and only 2 kurtas in his wardrobe. While long kurtas can be reserved for an informal meet or event, short kurtas can be worn on a daily basis to work, formal/client meetings. 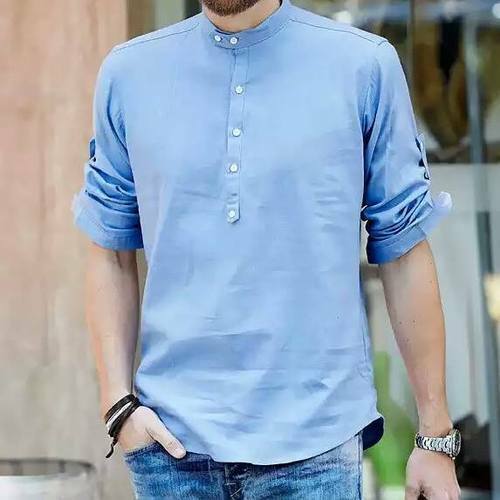 A pelvic-length kurta shirt will make you look sassy and sharp. You can also wear a kurta on a date to make her swoon! Now, kurtas for men come in all kinds of materials. But you wouldn’t dare wear a silk kurta on a scorching day. Similarly, you will freeze to death in a cotton kurta during the peak of winters. Seasons are the sole deciders of the fabric that you will adorn. Go for cotton, linen or khadi in summers as these fabrics don’t absorb much heat and allow for air to pass through them with ease. In winters, go for woollen, silk, or corduroy if you don’t want your teeth to clutter like ice-cubes in a whiskey glass. A little embroidery on the collar or the sleeves can add a designer touch to your kurta. You can play around with colours and contrasts. You can also opt for various embroidery styles such as zari work, chikankari, or zardosi. Keeping it plain and simple is a choice for many. Going overboard with styling and embellishments on your kurta can make you look tacky, therefore, tread carefully. The best thing about wearing a kurta is that it can be paired with anything and everything. Be it pants, jeans, churidar, jodhpurs, salwar and if you’re daring enough, you can pair your kurta with a lungi or dhoti for a royal look. Go for jeans, pants, or jodhpurs for a formal event/meet. You can opt for a salwar or dhoti for an informal function. At the end of the day, it’s all about what suits and goes best with your personality. But there are certain fashion faux pas that one must avoid. Say, for example, wearing sports shoes with a traditional kurta is a big no-no. Kurtas go best with mojris, kolapuris, and leather shoes. Also, wearing a kurta at a formal work event will make you stand out, and trust me, not in a good way. So, keep these tips in mind when picking out your next outfit and stand out from the crowd.